For this week’s Taco Tuesday, I’m reaching into the wayback machine, back to when I was a student in Mexico City. Oftentimes, I’d have a quick lunch at an impromptu service counter in a garage, where this not-so-friendly woman unveiled dozens of homemade taco fillings in cazuelas — just pick you want and she’d scoop it into a warm tortillas. Lady could cook. 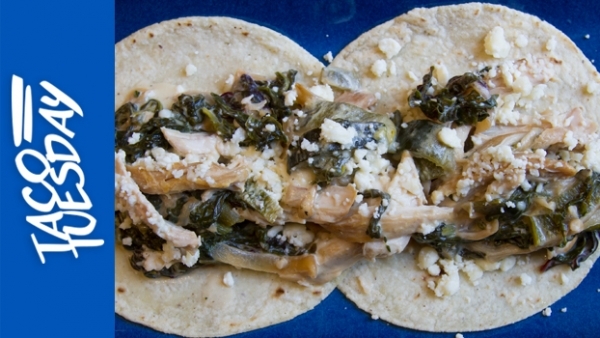 One of the standout tacos was this Creamy Chicken and Greens with Roasted Poblano and Caramelized Onion. For me, this dish has the perfect balance: meaty from chicken, vegetable-y from greens and onions and roasted poblanos, creamy from crema. It’s straight-forward good cooking that practically everyone finds incredibly delicious. Quick tips: Though the chicken is delicious sautéed, I’d take advantage of the last days of summer and grill it to add a little smokiness. Also, I’ve made this dish with all kinds of greens, and each adds something special.